Lovell, A.M., Stokes, C.R. and Jamieson, S.S.R. 2017. 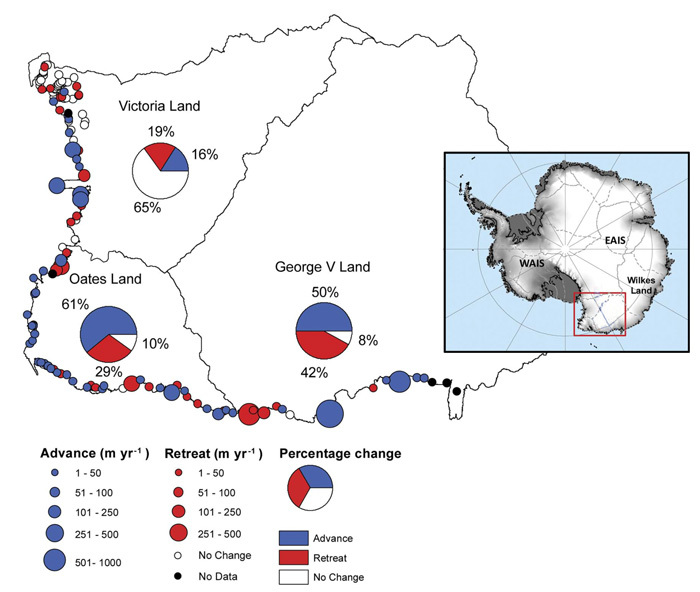 Sub-decadal variations in outlet glacier terminus positions in Victoria Land, Oates Land and George V Land, East Antarctica (1972-2013). Antarctic Science 29: 468-483. Relatively little is known about glacier change and sensitivity to climate in East Antarctica, the assessment of which is necessary to determine if the East Antarctic Ice Sheet is gaining mass, losing mass or experiencing little change. Hoping to provide some definitive answers in this regard, a team of three United Kingdom researchers (Lovell et al., 2017) set out to determine the temporal changes in the glacial terminus positions of 135 outlet glaciers (91 marine- and 44 land-terminating) spanning approximately 1000 km across three major drainage basins along the coastline of East Antarctica (Victoria Land, Oates Land and George V Land). This was accomplished by comparing terminus position changes in seven satellite images over the period 1972-2013. In describing their findings, Lovell et al. state that "between 1972 and 2013, 36% of glacier termini in the entire study area advanced and 25% of glacier termini retreated, with the remainder showing no discernible change outside of the measurement error (± 66 m or ± 1.6 m yr-1) and classified as 'no change'" (see figure below). Although there were some regional differences in glacier termini changes, the authors found no correlation with those changes and changes in air temperature or sea ice trends. Instead, they say that "sub-decadal glacier terminus variations in these regions over the last four decades were more closely linked to non-climatic drivers, such as terminus type and geometry, than any obvious climatic or oceanic forcing." The findings, or perhaps more correctly stated the lack of findings, reported by Lovell et al. are significant in that, for a region of the globe that is supposed to be the poster child of global warming alarmism, climate change has had no discernible impact on glacier terminus changes across 1000 km of the Antarctic coastline over the past four decades! Figure 1. Glacier terminus position change rates, 1972-2013. Pie charts show the percentage of glaciers within each region with advancing, retreating or stable termini. Source: Lovell et al. (2017).